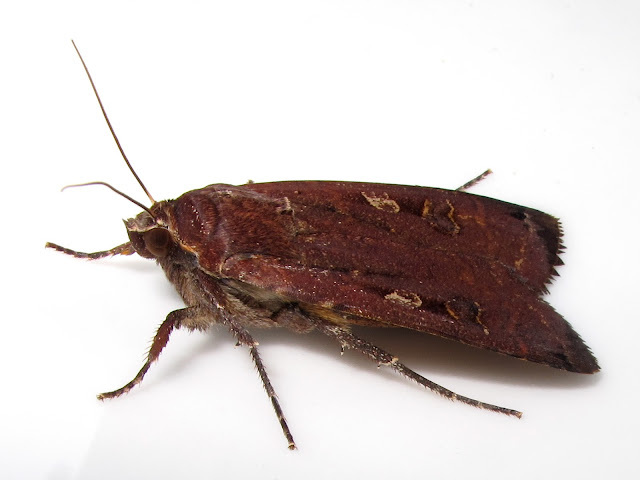 This noctuid moth, a male Large Yellow Underwing, Noctua pronuba entered the house a couple of nights ago and my cat alerted me to it. This is a large moth, very variable in colour: females are lighter than males, and both sexes have a black mark near the end of the wing. As most moths, they have a highly developed sense of hearing and can hear ultrasounds by means of a timpanal ear behind their middle legs, in order to detect and avoid echolocating bats. When they detect an incoming bat, moths carry out unpredictable flight maneuvers: suddenly flying up, carrying our loops or power diving or dropping with closed wings. Large Yellow Underwings also suddenly drop to the ground when they are flushed during the day. Their coloration is cryptic and they blend well with the leaf litter, so once they fall to the ground they are hard to spot. Avoidance of echolocating bats is thought to have been the selective pressure underlying the repeated evolution of bat detecting tympanal ears in moths. This happened repeatedly involving different anatomical regions in various moth families more than 50 million years ago. Surprisingly, the evolution of diurnal butterflies from their nocturnal moth ancestors appeared to have occurred at the same time: day flying and the subsequent radiation of butterflies resulted from a bat avoiding strategy.